Fungal Reaches, Gruul Guildgate, Timber Gorge are very not good even on a budget, i would recommend cutting these for any of these upgrades after evening out the manabase. I like all of the utility lands you put in though they are very fun! Sweet deck! A few suggestions would be to eliminate the lands the enter the battle field tapped, they slow the deck down. Kazandu Refuge and Rugged Highlands aren't worth the gaining of one life to enter tapped. I'd run Fire-Lit Thicket and Mossfire Valley instead. Savage Beating, Lurking Predators, and Birthing Pod could be fun cards to add in too. I'll add in all the lands you suggest. I'm taking out mountains, and I am also taking out mountains for dual producing lands to mitigate the hit on my green mana. This makes some of my ramp spells less usefull. Earthcraft is insane and is going straight into the deck. I don't want to go infinite in this deck, so I'll pass on the Squirrel Nest (at least for now). I have a preference towards not playing Craterhoof Behemoth, but it is a great addition to the deck. I'll have to think about Eldrazi Monument. It would have to push out one of my other anthems, and I'm not sure I want to do that. Awakening Zone and From Beyond fits the deck very nicely. I'll replace Skyshroud Claim and Chancellor of the Forge for those. Better curve, better ramp, and more creatures. Ivy Lane Denizen is a pretty nice combo with Ulasht, but is also quite usefull with the doublers and the theme. He'll get a spot. I've playtested your deck against a couple of mine, which I think are generally fairly close on the casual-hardcode scale. Here are my random thoughts and suggestions. Sapseep Forest - Entering tapped isn't worth the upside. Mogg Hollows - Only getting coloured mana every other turn seems bad. Karplusan Forest and Mossfire Valley - Two untapped mana-fixing lands. Mosswort Bridge and Spinerock Knoll - Both of these have requirements that should be easy to meet in your deck. They're really bad with X spells, but you have a lot of other useful targets. Clip Wings for Silklash Spider, a lot slower and more expensive, but reusable. Gruul Keyrune for Gruul Signet A 3/2 trample is really small in EDH, so I'd go for the lower mana cost if I were you. Lightning Bolt for Ulvenwald Tracker Basically Doom Blade on a stick with the huge guys you will be keeping around. Also fun with Thornbite Staff, which is also incredible ramp with Rosheen if you can arrange some other way to have creatures die. Volcanic Fallout would be an example. Might of Old Krosa One-off buffs aren't that great when you have three opponents you need to get down from 40 life. It's certainly not reliable as removal, either. Increasing Savagery Your many X-creatures turn mana into power and toughness. No need to have a separate card that does the same. Solidarity of Heroes Very powerful at the right time, but it's a one-off effect that requires some setup. Feral Incarnation - Three 3/3 beasts isn't worth the mana, and you don't have enough token generation to make it "free". Skarrg Guildmage - There are better trample-givers, like Nylea, God of the Hunt. Genesis In this type of deck with low-count high-value creatures I'd try to sneak this in, but it depends on how graveyard-hatey your meta is. Asceticism Again, high-value creatures that respond poorly to single-target removal. Keep your hydras safe! Death's Presence Even if your hydras die you get to keep most of their value. 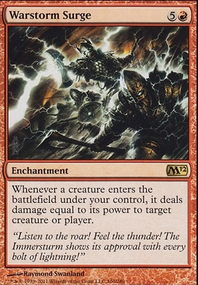 In the Web of War, Fires of Yavimaya or Xenagos, God of Revels - Haste on large creatures is huge, you can swing and kill someone without them getting the time to set up defence. Elemental Bond - Card draw when you play creatures keeps the creatures coming. Soul of the Harvest - As above. Aggravated Assault - The plan is to make lots of mana and huge creatures. Letting them work double shifts the next turn might secure a kill (or two). Selvala, Heart of the Wilds - She seems perfect for the deck. Huge creatures, huge mana, extra cards. Nykthos, Shrine to Nyx - In decks with two colours or less, this makes a lot of mana. To make room for this I'd personally cut all the treefolk. They're better in mono-green. It depends on your meta, but I'd also cut all planeswalkers except maybe Xenagos. They just tend to die so quickly in EDH. Xenagos generally at least pays for himself, though. 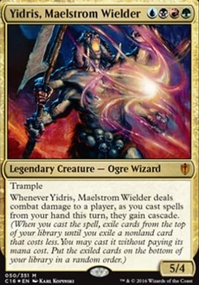 You could also consider multi-mana dorks, like Bloom Tender, Fyndhorn Elder, Greenweaver Druid, Nantuko Elder, Priest of Titania, Shaman of Forgotten Ways, Somberwald Sage, Whisperer of the Wilds, Wirewood Channeler, Karametra's Acolyte and dubiously Frontier Siege. If your big creatures are getting countered, consider Dosan the Falling Leaf, Gaea's Herald, Vexing Shusher. Finally, you could consider the staples Exploration, Burgeoning and Oracle of Mul Daya for early game ramp and Zendikar Resurgent for big mana (Mana Reflection being out of budget). I hope you can take at least something from this. You need more ramp. It's a creature aggro deck and you'll need to get more of them out than your opponents. You've got a Sol Ring, and I'd add Skyshroud Claim, Cultivate, Kodama's Reach, Nature's Lore, and Rampant Growth, maybe even Nissa's Pilgrimage. I wouldn't have less than five ramp cards in this deck, and probably be closer to seven. More draw or you're gonna run out of gas. Harmonize is easy, so is Outpost Siege. Someone suggested Temple Bell; that person isn't your friend and hates you. Bell draws you 1 card for every 3-4 it draws your opponents. Unless you're running hugs or Nekusar that's terrible math. Life's Legacy and Momentous Fall can do work, as can Shamanic Revelation. 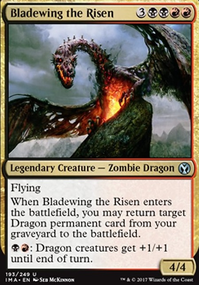 As with ramp, I wouldn't go with less than 5 draw sources, and seven is better. Ways to deal with back-breaking problems. Chaos Warp deals with anything, so does Beast Within. Find room for both. Broaden your land base. 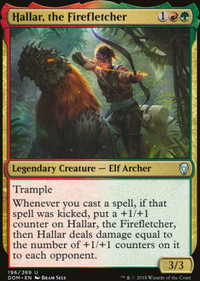 Taiga and Stomping Grounds are great but expensive, but Cinder Glade, Command Tower, Game Trail, Rootbound Crag, Karplusan Forest, and Mossfire Valley are all relatively cheap. No reason not to run Hanweir Battlements. A few colorless sources never hurt, and having haste on a land can win games. Feels like it needs Ancient Tomb, World Breaker, Rapacious One, and a fleet of filter lands like Mossfire Valley, Fire-Lit Thicket (which can produce colorless mana), and then some subset of Graven Cairns, Wooded Bastion, Cascade Bluffs, Twilight Mire, Rugged Prairie, and Flooded Grove (or all of them if dom has the money for that) again because they basically act as colorless dual lands which can turn other colorless lands into colored mana producers. 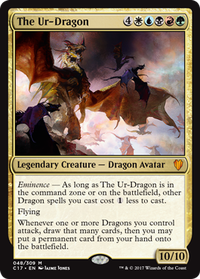 Urza's Incubator is great for any tribal deck and so is Door of Destinies and I agree with the above that ramp is necessary for Dragons. maybe upping the land count to 36-37 because 34 is super light for dragons. And maybe things like Cultivate and Kodama's Reach and lastly a Harrow for some more ramp spells. If you are willing to spend another $15 though picking up a Thran Dynamo and a Gilded Lotus would be great for the deck. Warstorm Surge is great for Dragons because they come out doing damage! Speaking of Dragons have you met Dragonstorm which is a late game bomb. Also I am not entirely sure why you are running Valakut, the Molten Pinnacle in the deck. It seems to slow and completely pointless for early and mid game(sorry don't mean to sound rude). Also I would take out Garruk for one of the Sarkhans if you really want another Planewalker to replace him. 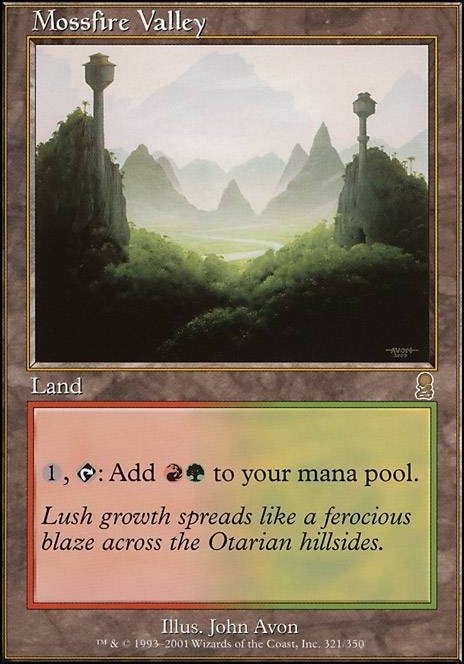 for your land base you can also run the more budget friendly r/g lands things like Rugged Highlands,Kazandu Refuge,Temple of Abandon,Temple of the False God, Game Trail, Timber Gorge,Mossfire Valley and lastly Karplusan Forest. There's also the two best budget fetches Terramorphic Expanse, and Evolving Wilds to help you get the colors you need. My final recommendations for you are Dragonlord Atarka, Dragonmaster Outcast, maybe a Skyline Despot and Fires of Yavimaya I hope this may have been helpful to you! Here is a list of cards that I would probably play. They are grouped into package's to help understand their function. If you wanted to get a little meaner. Lotus Cobra This is only if you plan on getting more fetchlands, because this makes the fetches into dark rituals.